Halliburton Inc. (NYSE: HAL) stock rose 2.05% Monday to $47.85 after reporting better-than-expected earnings. This is a nice preview of what's ahead for Halliburton shares. HAL stock was slashed in half from July 2014 to December, as oil prices also fell 50%. HAL stock has regained its footing in 2015, up 21% so far. We're just starting to see the painful effects of low oil across the energy sector, with Q1 earnings season now in full swing. According to FactSet, the energy sector is reporting the largest year-over-year (YOY) earnings decline (-64.4%) of all the S&P 500's 10 sectors. HAL's results were similar. The Houston, Texas-based company posted Q1 2015 earnings per share (EPS) of $0.49, excluding special items. That was down from $0.73 in the same quarter a year ago. Revenue slipped to $7.1 billion from $7.3 billion YOY. With expectations reduced, HAL managed to beat EPS estimates of $0.35 on revenue of $6.89 billion. But earnings and revenue are not the key issues here. 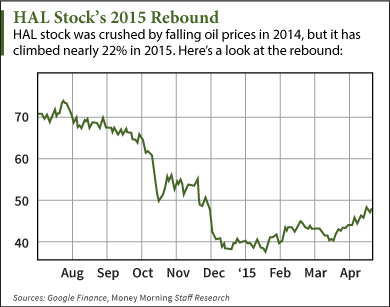 What's key is how the plunge in oil prices will impact the company going forward. Halliburton Chief Executive Office Dave Lesar said the decline in oil prices has caused an "unprecedented decline in drilling activity" in North America. Activity has dropped roughly 50% from the peak in late November. Oil driller Baker Hughes Inc. (NYSE: BHI) reported Friday that the number of U.S. oil rigs declined by 26 to 734 in the latest week. That was the lowest oil rig count since November 2010. Lesar added the company expects to "continue to see pricing pressure for our services until the rig count stabilizes." That might be in July. That's when Morgan Stanley says the rig count will bottom. So Halliburton is likely to feel some more pain in the current quarter. Thereafter, things look good for the company. For one, Halliburton hopes to close its $34.6 billion merger with Baker Hughes in the second half of 2015. The transaction – announced in November – brings together the world's second- and third-largest oil field services companies. Combined, the new company will have operations in more than 80 countries and a headcount of more than 136,000. The deal definitely looked better in November than it does today. The slide in oil prices wasn't as steep back then. Plus, earnings expectations at both Halliburton and Baker Hughes were rosier. In August 2014, analysts were looking for Halliburton to post EPS of $5.35 for 2015. At the start of November, projections had been trimmed to $4.62. Today, EPS forecasts have been slashed to $1.26. The outlook for Baker Hughes is similar. Forecasts for BHI's collective net income between 2015 and 2017 have fallen by $3.7 billion from estimates in late October. The difference in both companies, EPS estimates, The Wall Street Journal explained, is equal to more than 10% of the deal's original value. Still, HAL stock investors can expect better days after Halliburton and Baker Hughes join and navigate some rough patches. The two together are expected to save nearly $2 billion in costs through a combination of operations and research and development. Additionally, today's combined value of the two companies, including net debt, equals approximately 1.8 times their projected revenue over the next 12 months, according to The Journal. That's about what the two fetched in Q4 2009. Furthermore, oil will rise in 2015. The oil slump story has been one of supply and demand. But, that's set to change.